New at blogging and loving it! These scissors have a great magnetized case that allows storage on any metal surface. You can do practically anything with them as well. Pop a cap, unscrew a lid, descale fish, and of course cut open paper or plastic using the scissors. The silicone handle grips provide non slip action. I was in need of a pair of scissors only for kitchen use. I was tired of using my office scissors to open up bags of rice and fish, among other things. The size is perfect for my hands which are average. These are well constructed and worth every penny! I have several items from First Botany and have to confess…I am hooked on their quality. 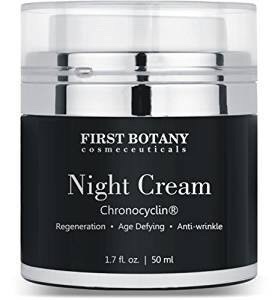 This night cream has not disappointed. After cleansing my face at bedtime, I use about a dime size amount in my palm, rub my hands together and then, using both hands spread the creamy mixture over my face. It goes on kind of thick feeling but dries to the touch. I don’t worry about getting the cream on my sheets and pillows. While I have not yet seen a difference in fine lines, I have to say my face is moisture rich even in this cold weather. I am using less of my daily moisturizer and don’t feel like my skin is too tight as I normally do after using some face creams which claim to reduce wrinkles or creases. I will continue to use this night cream and update should I get different results in the future. I recieved this item at a discount. My review is true and my honest opinion. Click here to see item on Amazon! These are very nicely built goggles. They appear to be sturdy and that they would be comfortable. The case the came in will provide the protection needed especially during storage or while carting your skis/snowboarding equipment. The toggle on the case allows you to connect it to your suit for prevention of losing the goggles while not being worn. The full coverage of the eye area on these goggles is great. No snow shine will get through. Click here to see these goggles on Amazon. This 22 brush set is all you will need to produce flawless results each and every time you put on your makeup. If you are anything like me, you will have that favorite brush and will use it until there are two little hairs left. With this enormous collection, you will not have that problem. There are angled, flat, sponge, fan, eyebrow brush, mascara and foundation brushes included with this set. The bristles on the pink hair pieces are soft and perfect for your delicate skin. They are made of synthetic and natural hair. These brushes are of good quality and the case they arrive in feels very luxurious. I would consider these as very gift worthy! Any female who wears makeup, would love to see these as a gift. Click here to see on Amazon! These are washable but take care to follow the directions on cleaning so these last a long time. Fit for sensitive skin, it can protect and beauty your skin well. Works well at giving added energy while taking in minimum calories. It has been my experience that when taking in less than 1000 calories daily, the energy levels dropped drastically. I appreciate the extra boost I get from cambogia. My weight loss has been slow but steady. There has been a lot of hype as of late on the miracles this product and similar ones are creating with weight loss. That has not been my experience but I can see the benefit of added energy. I would continue using this product for that reason alone. I have tried some that give off a weird odor but this brand has no offensive smell. Possibilities are endless with this huge set of clips and jute. From hanging kiddies art work to those cherished family photos, this set is sure to do the trick. Once secured, this jute string is quite sturdy. At approximately 30 feet for each strand, you could do so many different projects. The clips are colorful and well made of wood. With more than 100 clips you could choose other projects aside from using the jute. They are wooden so could be glued, nailed,stapled or attached in any way really.